The Bariatric Multifold ramp comes in 4 lengths and are 36" wide with an 800 pound capacity. If you need a ramp with handrails please see the Modular Ramp page or the Ontrac Ramp page. Download the Bariatric Ramp brochure. 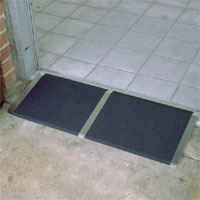 The bariatric threshold ramp rests on the threshold of the doorway and can be secured with a few screws if needed. The lightweight aluminum design comes in two sizes to help provide access over thresholds from 1-1/2" up to 4". The pre-drilled holes at the top of each ramp allow for quick and easy installation to the threshold. 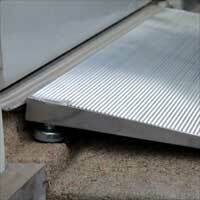 The aluminum Threshold Ramp by PVI is covered with an anti-slip, high traction surface to ensure safe passage. 800 pound rating, 36" wide. Download the bariatric ramp brochure. 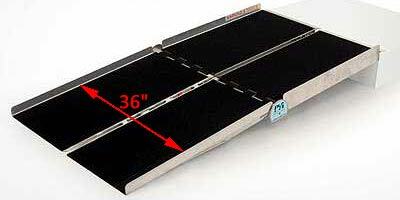 The Elev8 bariatric adjustable threshold ramp is 36" wide and used for rises from 1" to 6" depending on the length chosen. The feet on the ramp are adjustable up and down to fit your particular situation. While this product is primarily used for doors that swing towards the ramp, they can also be used for sliding glass doors, doors that swing inward, and many other types of doorways. 800 pound rating. ATH1236 is for a 1 to 2" rise. ATH2436 is for a 2 to 3.5" rise. ATH3636 is for a 3 to 5" rise. ATH4836 is for a 4 to 6" rise.